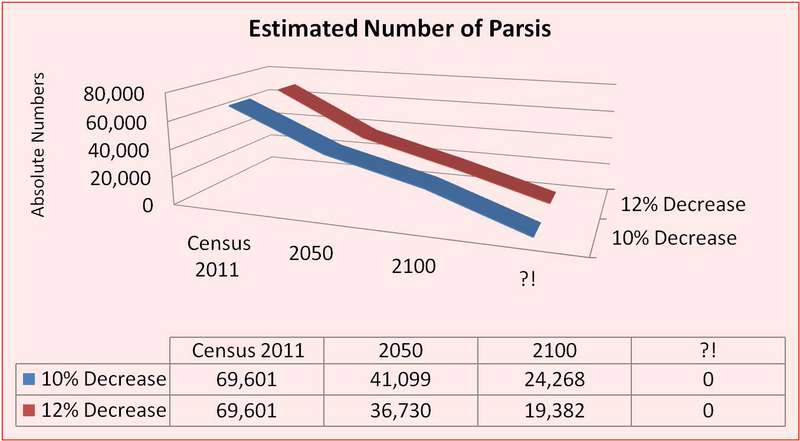 A lot has been said, written, and debated about the dwindling numbers of the already small Parsi community in India and world over. For the record, here in the National Capital Region of Delhi, which includes Gurgaon and Noida, we Parsis are quite concerned with our declining numbers, and dismayed by the ignorance/apathy that surrounds this subject. While many may not agree with our point of view, we’d appreciate healthy debate on the subject, rather than an ostrich-head-in-the-sand-approach – after all, openness to other points of view and depth of thinking are some of the key characteristics that make us who we are! Here’s a perspective on the subject, from Dinshaw Tamboly, with facts and figures in support of his thinking. “The community numbers as per the 2011 census when released will tell its own story. The most serious problem that our community is beset with is the problem of falling numbers which needs to be earnestly addressed and corrective action taken. of our community without teasing anybody, as this is an old practice. married with different caste people. married any different caste boy or girl. disappearance sooner rather than later. Dear Homi, you cannot enforce the Navjote ceremony of the children from mixed marriages. Whether you like it or not, it will depend on the more dominant parent. If the non-Parsi spouse (or parents of such non-parsi spouse) insists that the child be brought up as per their culture – there is precious little we can do (specially if father is non-Parsi). So once the gates are opened unfortunately we have little control. Even if for a moment we consider your argument, and enforce the Navjot of such a child, is there a guarantee that such a child will only marry a Parsi when he / she grows up? Most likely no (will likely follow the parents footsteps). So one generation down a line, we are again at the same ‘cross road’. Will he / she be able to ‘again’ convince the non-parsi spouse to perform Navjot of their children? So for every successive generation we are leaving it to chance (demographers say that in such scenarios the majority religions gain – minorities suffer over 2 – 3 generations). In spite of the over hyped ‘Wadia’ Navjotes, do we know if Neville’s grandsons Jeh and Ness are practicing Zoroastrians? Not so sure. Also, I believe the Delhi Parsis have long been a ‘liberal’ community and are open to ‘accept’ children of mixed marriages. I am keen to know if this practice has worked wonders for the Parsi population in Delhi? Have you seen growth rates increase dramatically over the years or are you still seeing declining numbers inspite of your ‘liberal stance’? Would like to hear back on this. Thank you for your point of view. I am sure there will be strong reactions for and against your perspective, but being the progressive people that we are, am sharing it here, for more discussion and debate. Hopefully, for answers to our dilemmas.